A common task when building an email form for your web site is creating validation for individual form questions. 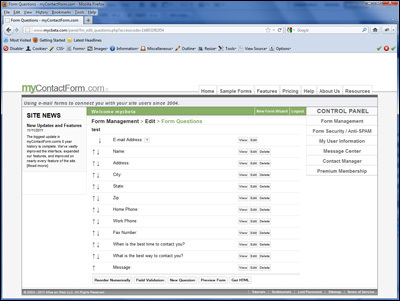 myContactForm.com makes it very easy to validate individual questions on your form. myContactForm.com offers a variety of types of validation for specific questions on your form including required questions, numeric range, number of characters, number of words, e-mail address validation, URL validation, date validation, phone number validation, alphanumeric characters, and special phrase validation. The tutorial below assumes that you have already built a form within the myContactForm.com software. This is quite easy to do. You my read a tutorial for creating a basic email form here. c. Go through the Form Wizard to create a new form. 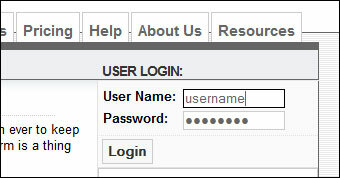 During the form wizard you will be given the option to make questions Required while entering the question specifics. If you have already created your form through the wizard. Proceed below. f. Click the Edit button next to the question you would like to make required. Check the box next to required and follow the rest of the on-screen instructions. This question will now be required. If the question is not answered, the form sender will be presented with an error message. The question answer will be checked that it is within a numberic range which you specify. The question answer will be checked that it contains a specific minimum and maximum number of characters which you specify. The question answer will be checked that it contains a specific minimum and maximum number of words which you specify. The question answer will be checked that it contains the appropriate syntax for e-mail addresses. The question answer will be checked that it contains the appropriate syntax for URLs. The question answer will be checked that it is the appropriate format you specify and that it is within the appropriate range which you specify. The question answer will be checked that it is the proper format for a US phone number. The question answer will be checked that it only contains alphnumeric characters. The question answer will be checked that it matches a specific special phrase which you specify. 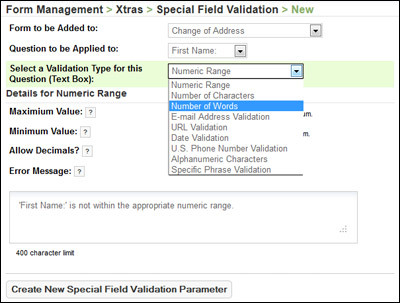 f. Follow the on-screen instructions for adding the field validation parameter you are looking to add.